New! Our popular SolaReflex diffused foil has been upgraded to a stronger, lighter, more flexible SolaReflexx foil, for many more uses like plant growing reflectors (right photo) to increase and speed growth. After over 12 years of extensive use in variety of applications, we've made some major improvements to our diffused SolaReflex Foil, and it is now available to order. 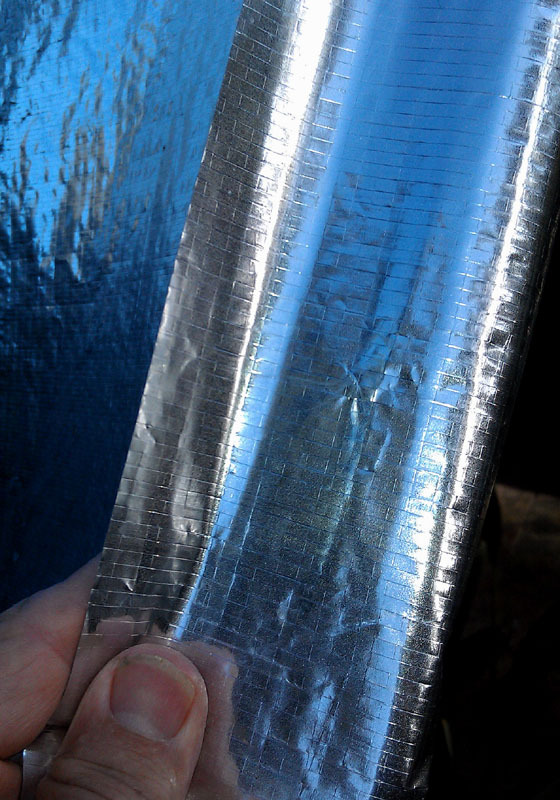 It is called SolaReflexx foil because of so many other uses and improvements. It is thinner, stronger, more flexible and more resistant to tears, weather and water or stains. And it comes in even larger sizes than before--up to 8' wide by hundreds of feet long. SolaReflexx Foil from ClearDome Solar Thermal is the best, most reflective low-cost diffused radiant solar reflector material available for controlling the intense sun's energy for passive cooling, heating, or for daylighting purposes to add more sunlight into a building or to add more daylight to shaded areas. We also have optional sturdy clamp-on tear resistant pressure grommets that make it much easier and stronger to secure the foil to rope or ties. SolaReflexx foil is also very useful in gardens or inside greenhouses by reflecting sunlight through windows or under plants to increase growth to the lower branches. Just attach it to a flat or curved sheet of plastic or wood paneling and set nearby in full sun. It can also be laid on the ground under and near the plants or hung from grommets as a curtain like our Veggie Garden2go plant reflector. 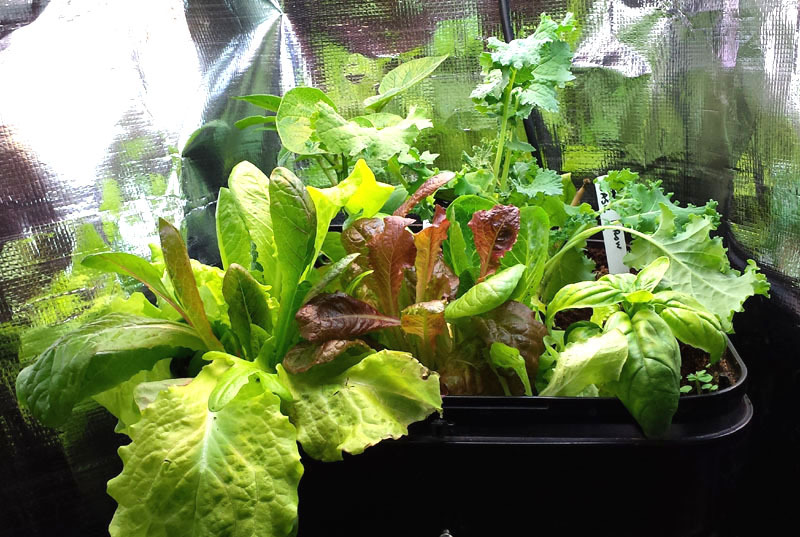 And have look at the new aeroponic Tower Garden food growing system (click for more details) , to see how wrapping SolaReflex foil around the water tank will keep it cooler on hot summer days by reflecting away sunshine and radiant ground heat. We have a smaller custom size available to attach to the tank. To increase plant growth for indoor grow light gardens like our top-rated hydroponic Veggie Garden2go food and pot growing system (upper right and lower left photos) it will boost lower plant light levels by over 50% so the plant grows more balanced like outdoor gardens-- comparable to moving sunlight. That means faster growing and larger, more robust plants without hot spot burning because it has exactly the right amount of diffusion. 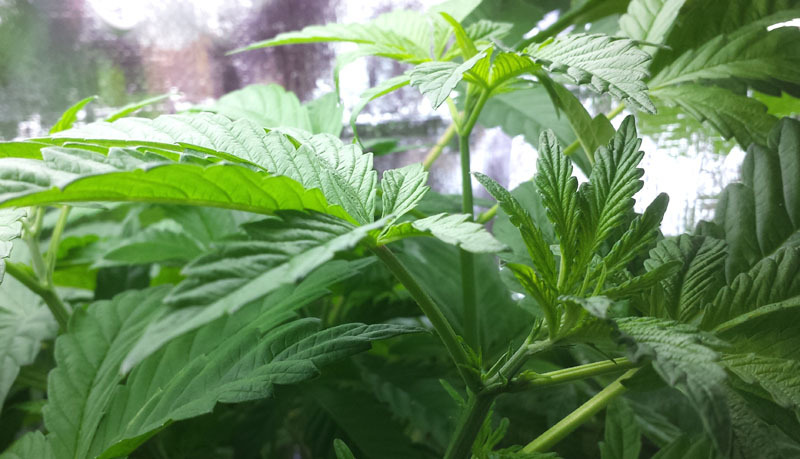 We can offer tips on how to best use it in your indoor vegetable or medicinal pot growing area. We now offer the world's most solar reflective and coolest tarp made that is about 25% more reflective than Thermal Barrier Fabric and is solid and rainproof. It is our 8' wide SolaReflexx reflective foil product called SolaReflexx CoolTarp (click for more details) , that also has optional removable grommets for easy installation anywhere in the hot sun. It will passively cool spaces underneath the hot summer sun by reflecting large areas of sunlight away from patios, tents, over roofs, RV's and boats, carports, work spaces, animal enclosures, and garden areas that are blasted by too much sunlight. It can also be used to reduce heat loss in cold winter months. Areas below SolaReflexx CoolTarp will stay within about 10-15 degrees of the ambient air temps. Unlike typical painted or light colored tarps that get very hot underneath in summer sun, CoolTarp has our reflective SolaReflexx metalized coated surface that has an invisible weather top coat on both sides of a rip-resistant center plastic layer that allows only a very small amount of heat to pass through, and no light, keeping that surface and space below it cool. It's not just a passive summer product because you can also use CoolTarp to drastically reduce heat loss through windows or on structures in freezing winter temperatures. Hang CoolTarp on the inside of windows to reflect nearly all the expensive heat back into the room before it radiates out the glass. It nearly matches the thermal resistance of a well-insulated wall by reflecting radiant energy away from the outside. SolaReflex flat, bendable 95.5% AA reflector panels --sturdy anodized aluminum sheets specially coated with our SolarReflex reflective surface, then over-coated with an invisible rock hard weatherproof coating on both sides for superior scratch, moisture, and salt air resistance. The protective weather coating causes only a slight loss of reflectivity in exchange for extended continuous outdoor use. Extreme accelerated age testing confirms a minimum 7-10 year life in all types of outdoor conditions--which is considered the longest life for outdoor solar reflectors. Most other outdoor solar reflectors have a 3-5 year life before the beginning of loss of reflectivity or reflector breakdown. 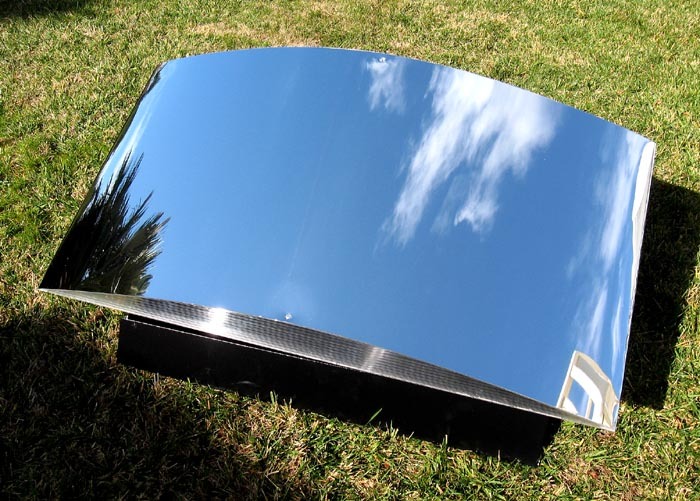 The bendable 2' X 4' mirror surface panels are specially designed to reflect full spectrum sunlight for flat and parabolic trough reflectors being used for solar thermal and concentrated solar PV applications. They're also ideal for solar daylighting where sunlight is reflected indoors through windows, or skylights, artificial light enhancement and other solar reflective projects like solar cookers and concentrators with 95% spectral reflection, so they'll generate the highest concentrated heat levels. They are first-surface reflectors and come in standard 2'x4' sheets. More info about our AA reflectors is available on our SolaReflex AA product web page by clicking here. It is so effective, this same type of material protects the astronauts and their equipment in outer space. Our search for the absolute best diffused solar reflecting material available for reflecting solar and radiant heat energy has ended. 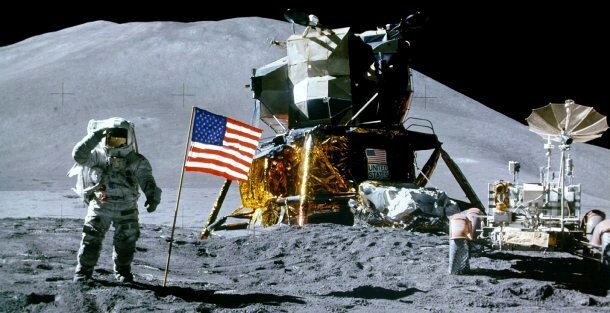 You can now benefit from over 50 years of private and government research, and NASA's continuing use in the space program to protect the astronauts in space. Their space suits and spacecraft have depended on this same type of triple-laminated, tear-resistant metallic fabric to protect their lives. Intense, unfiltered solar energy is reflected away, and their body heat is radiated back inside. This near-perfect radiant barrier works as well in outer space as it does on earth--for generating heat as a solar reflector. SolarReflexx foil is a diffused, but highly reflective material rated at 95% reflectivity and .03 emissivity that can be applied to any flat, parabolic or concentrator type solar reflector form where larger focal points are desired. It will withstand severe weather and radiant temperatures from -60 to 400 degrees F. At 6 mils thick, it is very difficult to tear by hand but easy to cut with scissors. And it can also be used as a daylighting reflector when positioned outside windows to brighten dark rooms and send solar energy (light and heat) back inside. Place it over windows or sunny surfaces to reject all but about 3% of the sun's heat and all light to keep it much cooler inside. It's easy to glue it to a flat surface for more direct reflection. Or, it will reflect nearly all solar energy away from structures when mounted on a flat surface to keep the interior much cooler. Get creative and think of the many other uses some of our customers have discovered. Such as, line the inside of a dog house or farm animal enclosure to reflect body heat back before it radiates away, keeping them much warmer. Even a sheet underneath their pad or pillow keeps them or yourself warmer. SolaReflexx Foil is also the reflector fabric we have chosen for tests with a new winter safety/survival prototype product called the "SolaReflexx Survival Cocoon", made completely out of this super sturdy and durable weatherproof foil. It's far more efficient, thicker, stronger and effective than Mylar space blankets for surviving in sub zero temperatures in the most extreme weather conditions. When surrounded by the large burrito-shaped Survival Cocoon, we've found that body heat alone (an average of 80-100 watts for an average adult) is nearly all reflected back towards the body and only a small amount of heat is lost to the outdoors. In recent tests on a 17 degree night our test subject dressed in only jeans and a tee shirt went from shivering outdoors to near instant warmth in only minutes. The inside cocoon air temps hovered between 65-69 degrees F in 10-15 minutes and stayed there for hours, which is a 30-35 degree heat gain using only the heat of the body. Besides surviving outdoors, other uses include using it indoors on cold nights during power outages, sitting in the stands at winter sports games, and for search and rescue teams that need to treat hypothermia victims. Use SolaReflex foil along with our thick and durable ClearDome BlackFlex heat absorbing aluminum foil in your own design solar heating device or for any solar heat absorption application. We've used it on our previous exterior forced air heaters because it's an excellent and long-lasting heat absorber material. 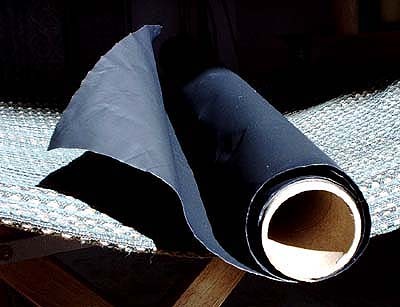 Click to buy $18- 2x4' Blackflex sheets with PayPal. Up to four sheets can be shipped in the same shipping tube. Here's why SolaReflexx diffused foil is superior for solar cooking and radiant heat deflection use: Outperforms every other type of solar heating reflector by 15-20%, including aluminum foil, Mylar, glass mirrors and most metals, for hotter, faster cooking and heating! Will withstand radiant temperatures to 400 degrees F, and below 60 degrees F.
ClearDome SolaReflexx foil can only be purchased from us on the Internet and cannot be purchased in retail stores. The standard 2' x 4' sheets are rolled into a three inch cardboard shipping tube,and can be shipped overseas. International shipping can double or more than that of the default USA shipping fee shown. Discount PayPal bulk ordering for larger sizes is available on this web page. .
Use your own black pots and pans by themselves, or surrounded with our ClearDome Box oven, Clear Dome pot cover; or clear plastic bags to prevent heat loss on cold days and in wind and for higher heating levels. For more information about this or any of our other innovative ClearDome Solar heating products including our solar forced air home heaters or solar heating drapes and thermal barrier fabric, please email Deris at: deris@cleardomesolar.com and visit our homepage at: www.cleardomesolar.com.